Are you interested in dental implants but a little hesitant about the surgery? Don’t be—this procedure to imbed an implant’s titanium post in the jawbone is relatively minor with little to no discomfort for most patients. Some time before, however, we’ll need to pre-plan the surgery to pinpoint the best location for the implant, critical to achieving a solid hold and a life-like appearance. During these first visits we often create a surgical guide, a device inserted in the mouth during surgery that identifies the exact location for the hole (or channel) in the bone we’ll drill to insert the implant. On surgery day, we’ll prepare you for a pain-free and relaxing experience. If you’re normally anxious about dental work, we may prescribe a sedative for you to take ahead of time. As we begin we’ll thoroughly numb the area with local anesthesia to ensure you won’t feel any pain. The surgery begins with an incision through the gum tissue to access the underlying bone. Once it’s exposed, we’ll insert the surgical guide and begin a drilling sequence to gradually increase the size of the channel. This takes time because we want to avoid damaging the bone from overheating caused by friction. Once we’ve created a channel that matches precisely the implant’s size and shape, we’ll remove the implant from its sterile packaging and immediately fit and secure it in the channel. We’ll then take x-rays to ensure it’s in the best position possible. Satisfied we’ve properly situated and secured the implant, we’ll suture the gum tissue back in place to protect the implant with or without attaching a healing abutment to it as it fully integrates with the jawbone over the next few months (after which you’ll come back to receive your permanent crown). After a short recovery, you’ll return to full activity. Most patients only experience mild to moderate discomfort usually manageable with over-the-counter pain medication like aspirin or ibuprofen. 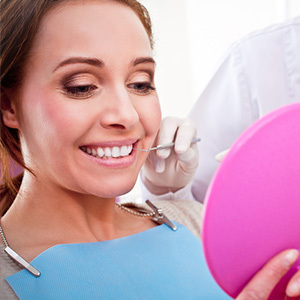 While implantation is a long process, you’ll be obtaining what’s considered by most dentists and their patients as the most durable and life-like tooth replacement available. Your new attractive smile will be well worth it.